Bishop Manuel Ernesto blesses the Archbishop after his licensing. The Archbishop of Cape Town has presided over the launch of a third Anglican diocese in Mozambique. On 16 March 2019 the Most Rev. Thabo Makgoba inaugurated the Missionary Diocese of Nampula at a ceremony held at the Parish of St John the Evangelist. 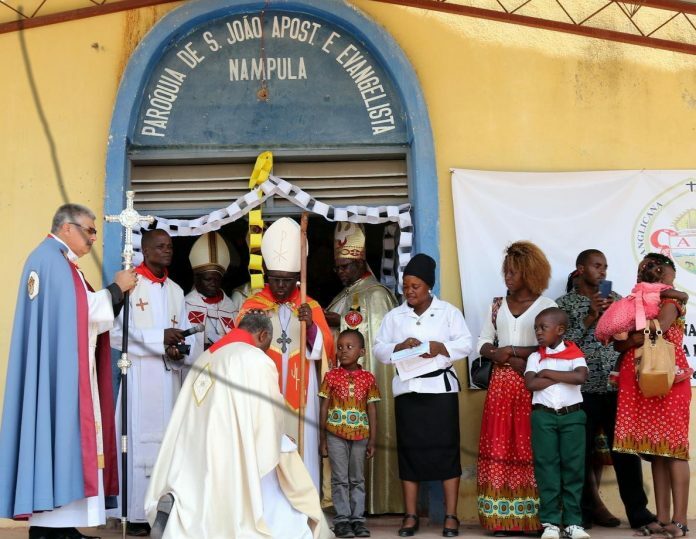 The diocese covers the provinces of Cabo Delgado and Nampula in northern Mozambique and had been part of the Diocese of Niassa, which now is comprised of the provinces of Niassa, Zambezia and portions of Tete. The suffragan bishop of Niassa, the Rt. Rev. Manuel Ernesto, was installed as missionary bishop of the diocese. ReebHerb on Will ACNA be invited to Lambeth 2020? dannybhoy on Will ACNA be invited to Lambeth 2020?